Stan Lee Teaches Me How to...Draw? I found this book at a craft store near the section for drawing supplies with some "how to" books for people who want to sketch everything from furries to spaceships. The book didn't agitate me, it is your usual drawing-guide, but the title bugged me. A lot. Honestly, probably more than it should, but if I explain my feelings perhaps people will agree they are justified. Let's start with a fact: Stan Lee is probably the most famous name in comics that isn't a fictional character. Sure, everyone in the world may know who Superman is, but do they know who created him (Hint: it was two guys who later got screwed-over by DC)? 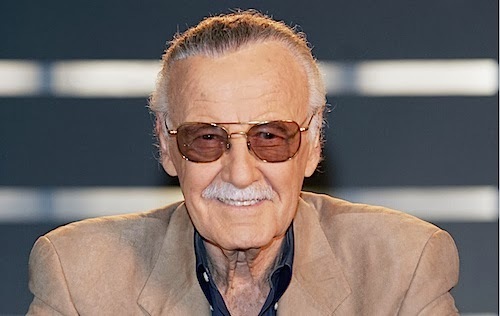 Ask your average guy/gal on the street to name a famous comic-maker and they will almost assuredly say, "Stan Lee," regardless of if they know what characters he created, or even what publisher he made them for--"That company with, 'The Avengers,' right?" Stan Lee wasn't just a writer, he was and continues to be a master showman, expertly using the press to garner recognition for himself and the art form of comics. All that as it is though, Stan Lee was never an artist. How in the Hell would Stan Lee know anything about telling me how to draw comics? He could tell me a bit about writing, especially using "The Marvel Method", but illustrating? Kirby (Left) and Lee (Right) back in the old days. I've always said how I feel that I and many comic-book readers have a complicated relationship with Stan Lee. That is an opinion though. It is a fact that Stan Lee was never an artist. Depending on whom you ask, "Stan the Man" either wrote detailed scripts for his artists and did all the "heavy lifting" creativity-wise, or would just throw out an idea to his collaborators such as Ditko or Kirby and they would then pretty much do all the work (until the end when Stan would pencil in some dialogue to go with the amazing creations he had almost nothing to do with). This fascinating article/editorial delves into some of these issues and points out that regardless of what we think, it seems Stan will always feel he deserves the lion share of the credit because in the end, it was his ideas and masterful press-maneuvering that got Marvel where it is today (at least, that is arguably what he believes). Still, all of that said, Stan Lee was never an artist. Stan Lee may have churned out scripts with great effort or sat around doing little besides providing ideas--as I've stated, it depends on whom you ask--but I think everyone who knows the slightest bit about comics can agree Lee never actually put pencil to paper in an effort to illustrate the creations of his collaborators and himself. Should you look closely at the bottom of that book you'll see it describes how they are examples from big names such as the aforementioned Kirby, so it is good he and other artists are getting their due, but that due is coming in the form of very small print, at the bottom of the book--the book which loudly exclaims in its title how Stan Lee of all people is going to tell you the way to draw comics. That just bugs me, immensely. Jack Kirby has passed on and Steve Ditko has chosen a life of quiet isolation putting out the occasional Objectivist-themed comic but otherwise shying away from the media as if a single quote to them would kill him. Also, many of Lee's other less-known collaborators are no longer with us. Lee is still alive and as much the showman as he ever was, though. If you're the last one alive, and most of the old guard of comics have died out, then basically what you say is all people have to take as the facts. Stan Lee was always the more press-savvy one, talkative one, and otherwise charismatic-half of any writer-artist duo he was a part of. The man is just quite possibly one of the best wranglers of press ever, capable of garnering attention and T.V. cameras still today in his 90's. Perhaps because of his ability to promote comics, as well as himself, and through simply living the longest, Stan Lee has won. He gets the last word, and he has been around long enough and done enough work (even if you think it was relatively little) to have every right to put out a book telling folk how to make comics the way he did, and maybe, just maybe, succeed at it. Still, even if Lee has earned the right to put out that book, he frankly lacks the skill to tell us how to draw these potential comics. Lee was never an artist, he was a writer, ideas-guy, and showman. 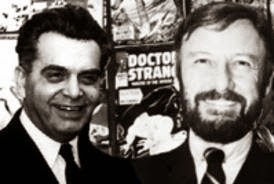 He contributed so much to this industry, and I feel he did do a fair amount of hard work making all those comics and their characters that now garner billions of dollars a year thanks to movies and merchandising. Lee had an impact on this industry that cannot even begin to be measured, and I'm truly thankful for all that he has done and continues to do...BUT, he was never an artist. For that reason a simple book and its title really irritated me when I saw it at that craft store, and I just wanted to share with everyone why, even if in the process I come across as a bit nit-picky or whiny. I don't mind if I do though, because for all he did Lee was never an artist. Without those artists all the ideas and showmanship in the world would have meant nothing, so please don't tell me your book is going to have Stan Lee instructing me in the ways of drawing comics. It insults both the reader and all those folk Lee has worked with.